The Little Sisters of the Poor were honored to learn last month that we would be the recipients of a 2019 Lumen Gentium Catholic Service Award from the Diocese of Providence. These awards are intended to recognize individuals and groups for their contributions to the life of the Church and service to those most in need in our diocese. The Little Sisters are humbled to be named recipients of this year’s award in the category of “Community Service and Charitable Outreach” and honored to be counted among those organizations who have contributed to the life of our diocese. Since 1881, the Little Sisters of the Poor have ministered to those in need in Rhode Island, first in Providence, then in the Holy Trinity Home in Pawtucket and now in the Jeanne Jugan Residence on Main Street. In that time, we have been blessed to experience the devoted service and friendship of generations of volunteers, supporters, benefactors and staff, as well as the companionship of our many residents who have lived at the home over the years. In accepting this award, we wish to express our deep gratitude and recognize the efforts of so many who have allowed Saint Jeanne Jugan’s mission to thrive in Rhode Island. 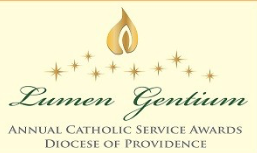 Bishop Thomas J. Tobin will present the award during the seventh annual Lumen Gentium Awards Dinner at the Twin River Event Center in Lincoln, Rhode Island, on Wednesday, May 15, at 6 p.m. All are invited to join us and celebrate this special recognition of our mission along with the other recipients of this year’s awards. Tickets for the event are available for purchase by clicking the link below. All proceeds from the dinner will benefit youth ministry programs in the Diocese of Providence. We thank all of you who have made our ministry possible and invite you to join us on May 15. We look forward to sharing with you more about this honor and the Little Sisters’ mission in a soon-to-be published profile in the Rhode Island Catholic newspaper. For more information on the Lumen Gentium Awards Dinner and to purchase tickets, click here.